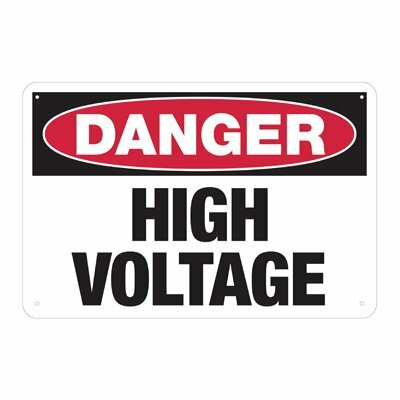 Danger high voltage labels and signs come in a full range of sizes and materials for all your electrical hazard identification needs. What size do you need? 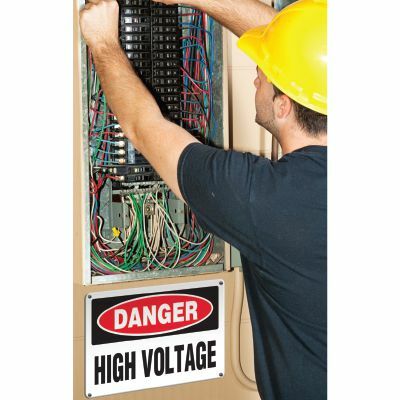 Where space is limited the use of a 3-1/2" x 5" or 5" x 7" sign is the best option. For warehouse and factory applications where you need a larger sign, we recommend our 7’ x 10" (15’ viewing distance), 10" x 14" (25’ viewing distance) or 14" x 20" (40’ viewing distance) sizes. Our large sizes (18" x 24" up to 36" x 48") are excellent choices for outdoor applications and anywhere you need to view the signs from a greater distance. What material do you need? Aluminum is the most popular choice as its durability and rust-proof property makes it ideal for a wide variety of applications indoors or outdoors. Plastic is lightweight and flexible for a wide array of usages. Plastic and Aluminum both come with pre-punched mounting holes. Adhesive Vinyl bonds to any smooth, dry surface and is also a great choice for curved surfaces. Reflective or Non-Reflective? Choosing where you need a reflective material or not comes down to the availability of good consistent lighting. For all outdoor applications we would always recommend choosing Engineer Grade Reflective as it provides up to 500 feet of visibility in nighttime conditions. For indoor where lighting is optimal and visual distraction are minimal, then a non-reflective material makes for a good choice. Why not laminate? Our exclusive SetonUltraTuff™ overlaminate option offers a lifetime guarantee. It’s the best defense against fading, graffiti, and chemicals. So for a few dollars more, why not opt for a lifetime of protection?